The place, where the nature meets 4* amenity of the hotel, will brings you unforgettable moments. The hotel presents comfortable accommodation at 14 fully equipped standard rooms. In the cozy atmosphere of the hotel restaurant, daily opened from 9 till 22 inthe evening, you can taste specialties of our cuisine. The place, where the nature meets the comfort of the modern hotel, will brings you unforgettable moments. Hotel Jizerka 4 was built on basement of original building (dated since 1882) which is located directly under the Bukovec hill. Buildings architecture is in harmony with genius loci of the local nature, within all expectations of modern travelling and accommodation. The location of the hotel enticing for sport activities such as cross-country skiing during the winter, bicycling or simple walking tours in summer times. Cross-country skiers, hikers and cyclists will appreciate a lot of kilometers of groomed trails and roads. Surroundings offer a many of turist traces on both sides of Czech or Polish mountains of Jizerske Hory mountains. You can enjoy a splendid view on all beautiful landscape of mountains from the hotel. 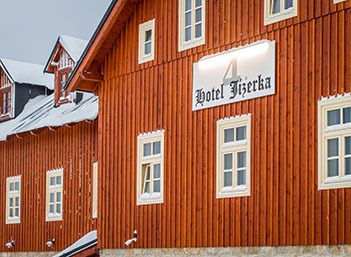 Hotel Jizerka4 is the right choice to stay for individual travelers or families visiting Jizerske Hory mountains. 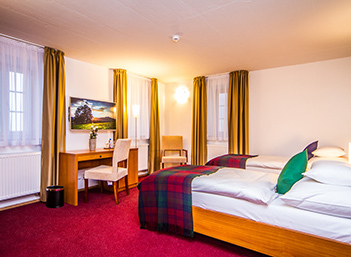 The hotel offers accommodation at 14 fully equipped standard rooms. Enjoy the atmosphere of the mountains in the end of the day at our bar with refreshing drinks. Relax your body and mind at our wellness center after a hard day work out. The parking in the hotel area is for free of charge. It is necessary to request it before your arrival upon grant you the receipt to enter to the national park by car. Storage for skies & bicycles is free to use anytime during your stay at the hotel. 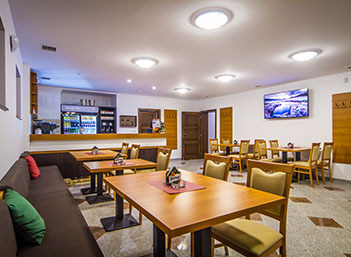 From authentic Czech dishes to cosmopolitan cuisine, the hotel restaurant is a right place to enjoy the meal. Marketing agency Dorland s. r. o.